CAMI Research Inc. (Acton, MA) has appointed two new distributors for its CableEye cable and harness testing systems. Semicon (Poland & Eastern Europe), and LK Hitech (Korea) bring the number of global distributors to twenty. 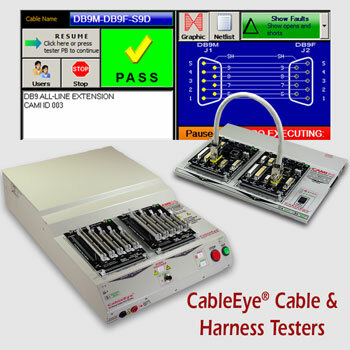 A leader in development of PC-based Cable & Wire Harness Test Systems for over 20 years, CAMI offers the CableEye suite of Low and High Voltage (HiPot) products. Both Semicon and LK Hitech sought out their distributorships having been impressed with the quality, versatility, and ease of use of the testers. CAMI is also seeking a distributor in Spain with experience in sales, promotion, & distribution of electronic test equipment. For further information, please contact sales@camiresearch.com or +1 (978) 266-2655. CAMI Research produces expandable and upgradable diagnostic Cable & Harness Test Systems for assembly, prototyping, production, and QC of standard or custom cables. CableEye® Testers display, and document electrical properties such as continuity, resistance, capacitance, dielectric breakdown, insulation resistance, miswires, and intermittent defects. For all of the above plus precision resistance (4-wire), and capacitance (twist wire relationship, length of cable, length to break, capacitors). For all as described for M3U, M3UH plus 4-Wire Kelvin Measurement and HiPot (dielectric withstand voltage and insulation resistance). Capacitance measurement (twist wire relationship, length of cable, length to break, capacitors) is an option.